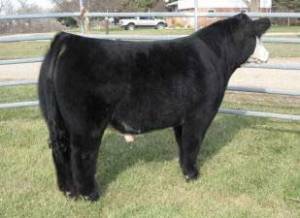 BFW Eye Opener E147W (Mitten Man x Grissley Mitten/Maine), will travel to Denver as our herd sire display bull. We have elected to retain this black baldy in our program. We have consigned his (bwf) full sisters in recent years at Denver through the Chianina breed sale. PHAF, THF, AMF, NHF.